It’s been a cold wet June in Seattle. The other morning I couldn’t seem to chase the chill out of my bones and wanted something warm for lunch. The fresh flavor and vibrant green color of this spinach soup delivered a little taste of spring and warmed me right up. This soup was only partly inspired by my chilled bones the other factor was the abundance of spinach growing in my garden. My little garden was producing faster than we could consume. This being a spur of the moment endeavor, the ingredient list comes from what I had on hand at the time. In an effort to keep my spinach plants in check, I have made this a few times now and settled in on a recipe I consider a keeper. 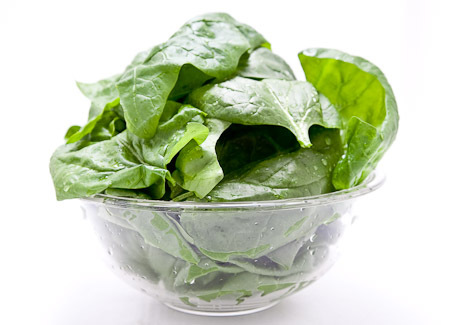 The mild and sweet flavor of the spinach is accented with a lovely bite of heat from fresh ginger and black pepper, and then rounded out with a touch of cream and comforting aroma of nutmeg. Besides tasting great my favorite thing about this soup is it can be made in about 20 minutes and costs next to nothing, especially if you happen to grow the spinach. As much as I enjoy cooking and consider it to be a relaxing part of my day, I still like to be speedy and efficient about it. Nothing has improved my speed and efficiency more than developing my knife skills. This practice exercise using a bench scraper from Rouxbe Online Cooking School, made such a difference for me. Cutting up an onion is the most difficult part of making this soup. If you get the hang of using the rolling technique demonstrated above, you’ll be able to knock this soup out in nothing flat. The herbs are a flexible element. I added a handful of chervil in one batch because it too was getting a little out of control in the garden. I have also used a mix of chervil, parsley and fennel with excellent results. 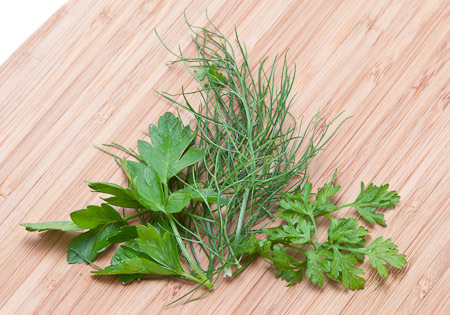 A mix of any mild herbs you might happen to have on hand will work just fine. Next time I’ll try using cilantro. 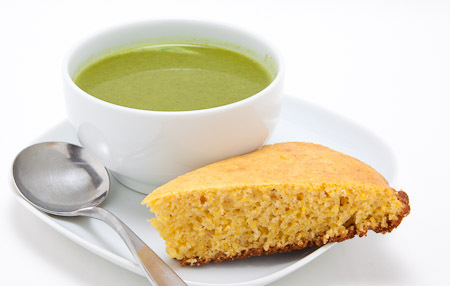 Spontaneous Spinach Soup served steaming hot with a grilled cheese sandwich is a lunch that will make you happy even if it’s rainy and cold in June. If you happen to be enjoying sunny warm weather, serve it chilled; it would make a nice starter for your next dinner party. Update: I made this again using cliantro and it was wonderful. If you found the Rouxbe video helpful and would like to check out their online cooking school content for free for 14 days, be our guest! Tags: Chrivel, Coriander, Fennel, parsley, Using a chef's knife This entry was posted on Saturday, June 19th, 2010 at 1:58 pm	and is filed under Cooking on a budget, Rouxbe.com, Soups & Stews, Vegetables. You can follow any responses to this entry through the RSS 2.0 feed. You can leave a response, or trackback from your own site.